I was ready for something that didn't require multiple risings and many steps, and these Sacaduros fit the bill. 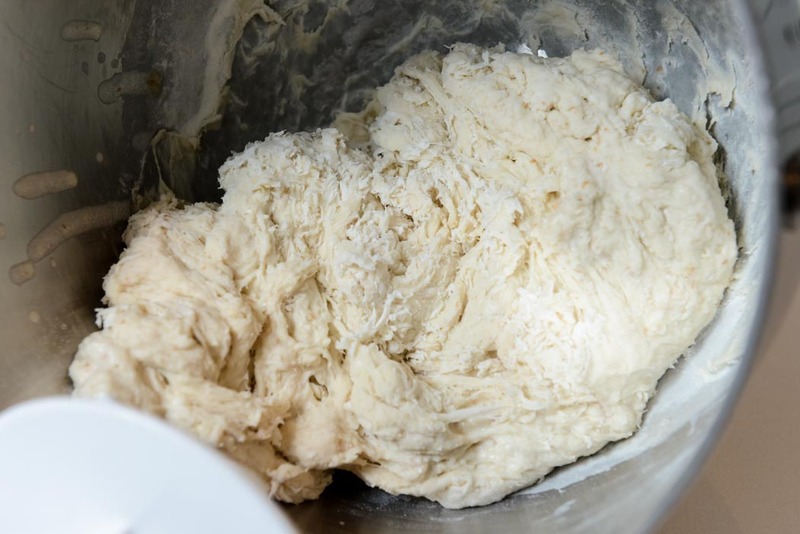 I made the full recipe of Basic Hearth Bread Dough, mostly because I was too lazy to do the math for 75%. I felt confident that the extra 25% wouldn't go to waste. 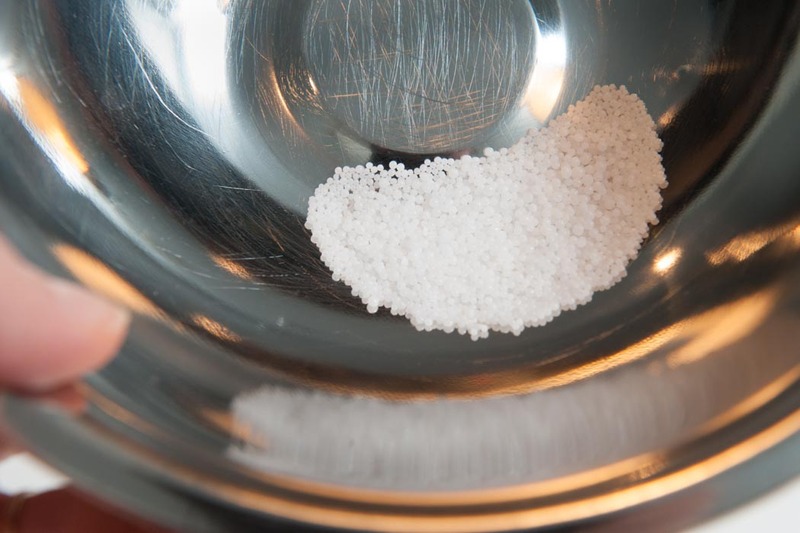 Afterall, butter, salt and Daniel Boulud felt like a sure thing. I was right. 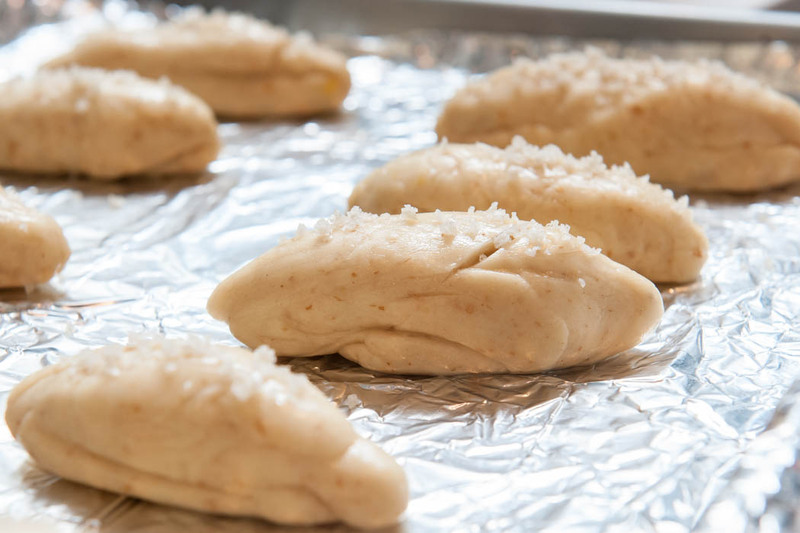 Making these Sacaduros was a treat for me and even though the dough didn't unfold like it was suppose to, I still enjoyed the deep buttery and salty flavours. 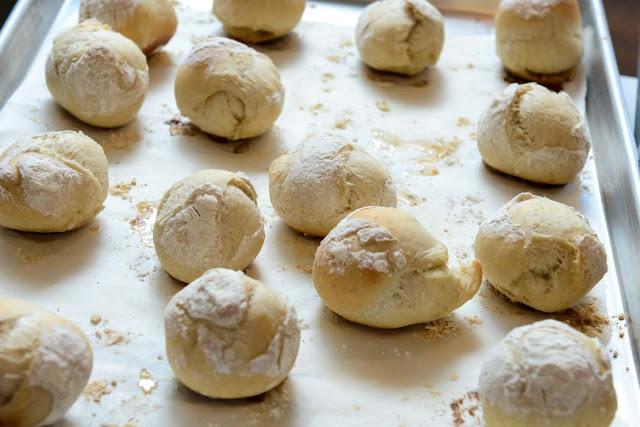 I think they didn't unfold because I kept the dough a bit too sticky while shaping the rolls. 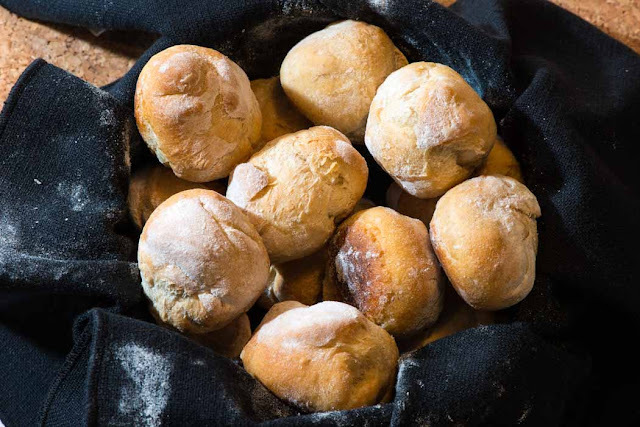 The Sacarduros are best when fresh out of the oven because that's when they are the easiest to eat and the most addictive. The next day, the hard crust softened and they became a bit too chewy. Still the butter and salt was really enjoyable. 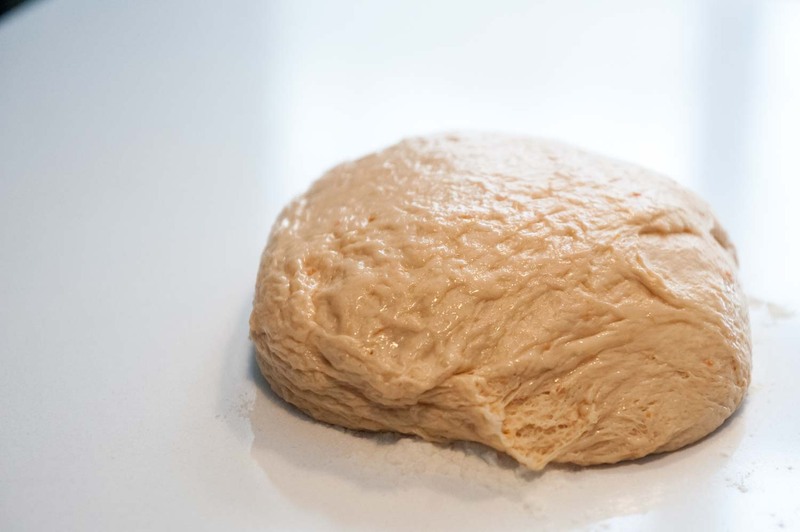 This dough starter took a good deal of water, more than usual. It was no problem really, but I took notice of how loose it was. I also enjoy seeing the dough starter heave the flour blanket and crack it like it's the earth's mantel or something. Stand back! I used the Kitchen Aid for this recipe since my back was acting up. 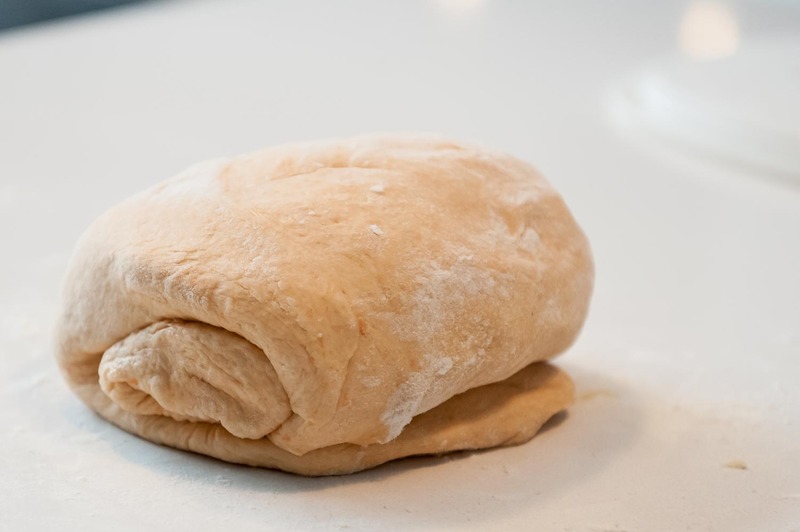 I didn't let it rise, I just used the dough right away. I think this was correct. 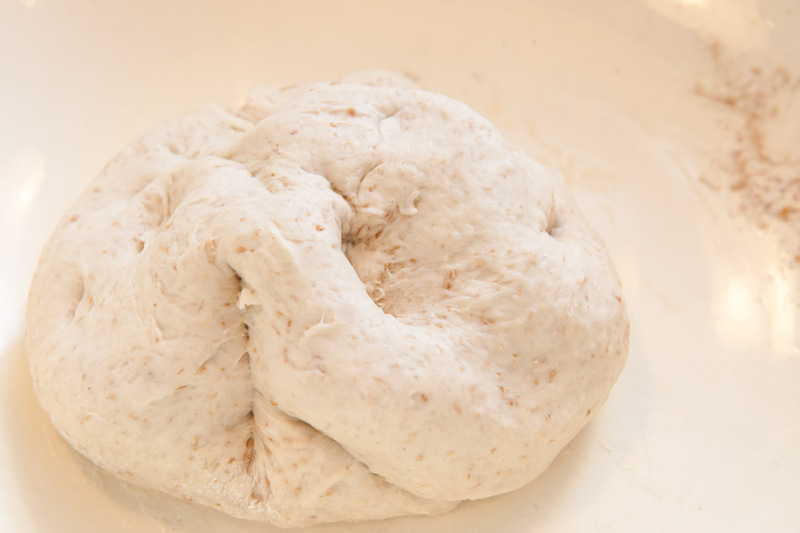 The sacaduro dough just after it was mixed. 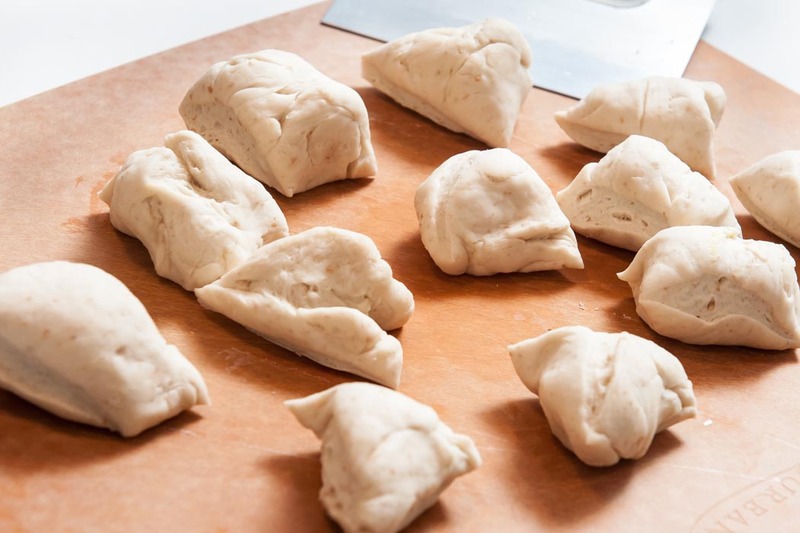 I weighed the dough pieces to approximately 33 grams each and began to shape each roll. The dough stuck to itself very easily, but I was confused as to how many times to pull the dough. The instructions said to pull 3 times, but the picture showed pulling 4 times. I pulled the dough 4 times as it seemed to make the most sense in the moment. I found that they came to temperature very quickly, well before they browned, so I left them in the oven until they became crusty. The internal temp went well past 190F, and that is probably why the next day they became dry and chewy. A picture says a thousand words, at least that’s what they say. Indeed, the image of the New Zealand Almond Fig Bread in the Bread Bible is so attractive and delicious looking, it just seemed like an obvious choice for this month. 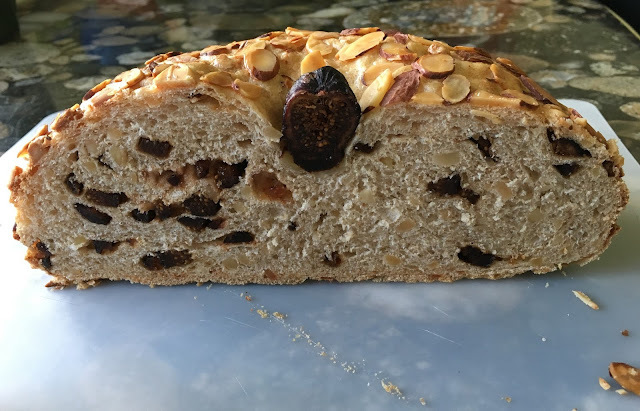 Nancy's loaf looks as beautiful as Rose's picture, with her dried black figs, almond nuggets and beautifully browned almond slices. Very nice! All of the Alpha Bakers were enthusiastic about making this attractive loaf. As well, everyone seemed to agree that they preferred a loaf that was a little less dense. Still, the Almond and Fig Bread turned out well across the board and was successful. 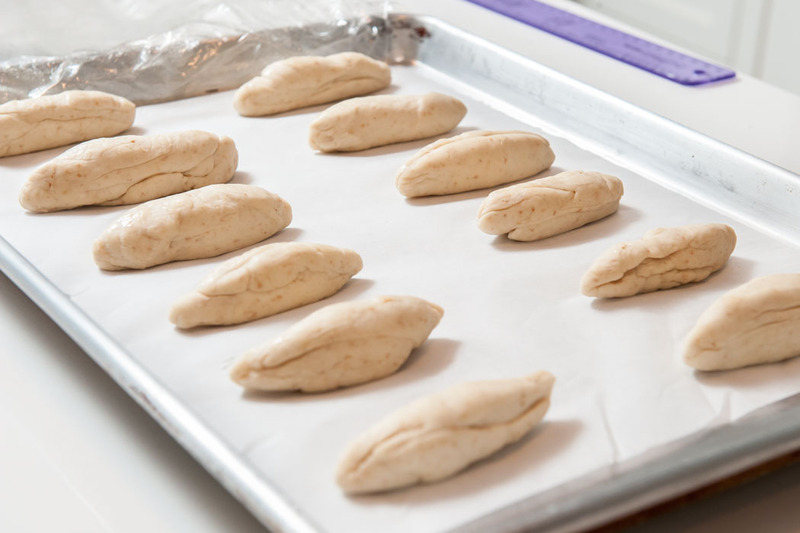 For Nancy, this is her second time making this bread, and having learned, she made a few key changes. First, she didn't like the apricot jam coating, so she brushed the almonds with egg white instead, which made the bread brown faster. (Her trusty foil cape saved it from charring.) Still, even after the second time, she admits that the flavour isn’t stellar, but the loaf is still very pretty and the figs give a nice effect. For Svetlana, living in Israel, where figs are fresh and delicious, black figs are not commonly dried as often and are harder to find than the light brown variety. She had to make a special trip to a health food store to find the dark figs for this bread. 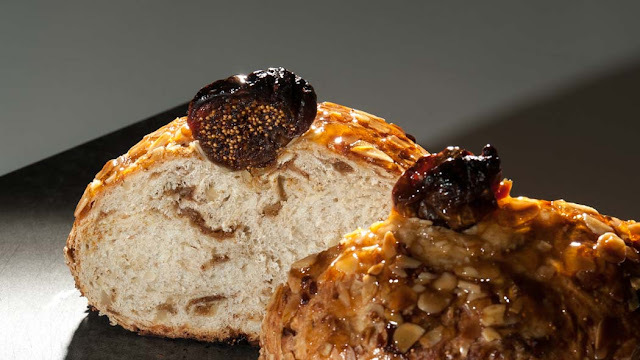 It was well worth her efforts because she felt the figs paired perfectly with the almonds, and the apricot glaze added a lovely shine and touch of sweetness. She enjoyed the loaf as is, but also thought soft white and blue cheeses complimented it as well. Marie B’s Fig and Almond Loaf cut beautifully and yielded a terrific looking crumb. 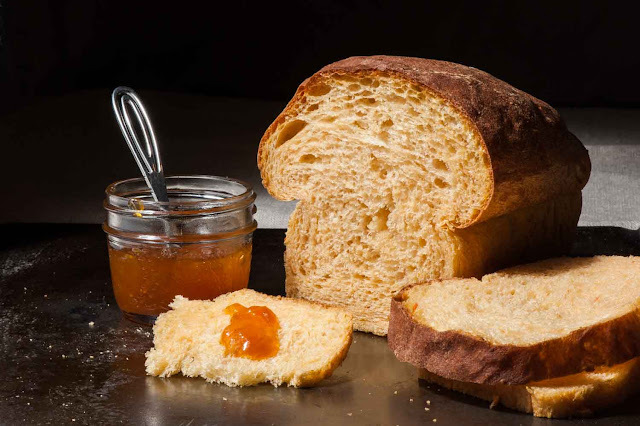 For her though, she too preferred the lighter texture of the Harvest Bread to the denseness of this loaf. Still she was glad to have tried it. Next month are the Sacaduros on page 315. The tiny cube of butter and flour de sel inside the dinner roll sounds charming. 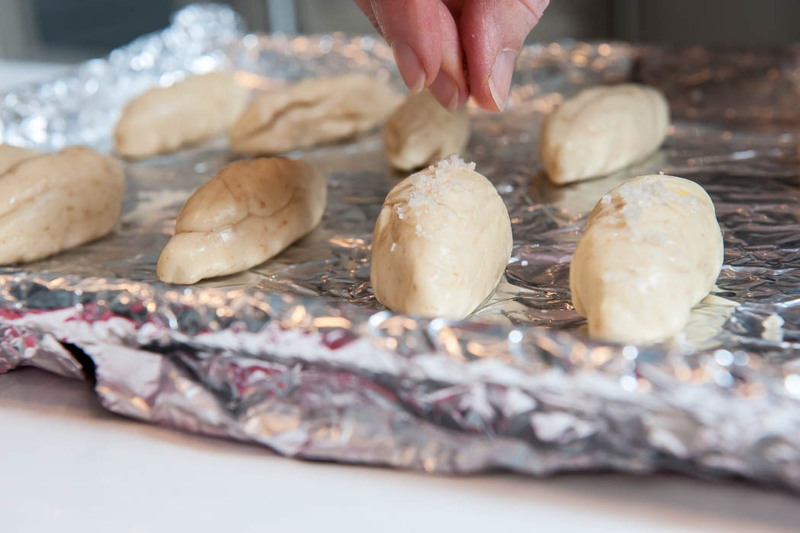 It's time we tried out hands at a quick and easy recipe. Right? With Easter early this year, the New Zealand Almond and Fig Bread seemed to be a perfect compliment to spring. 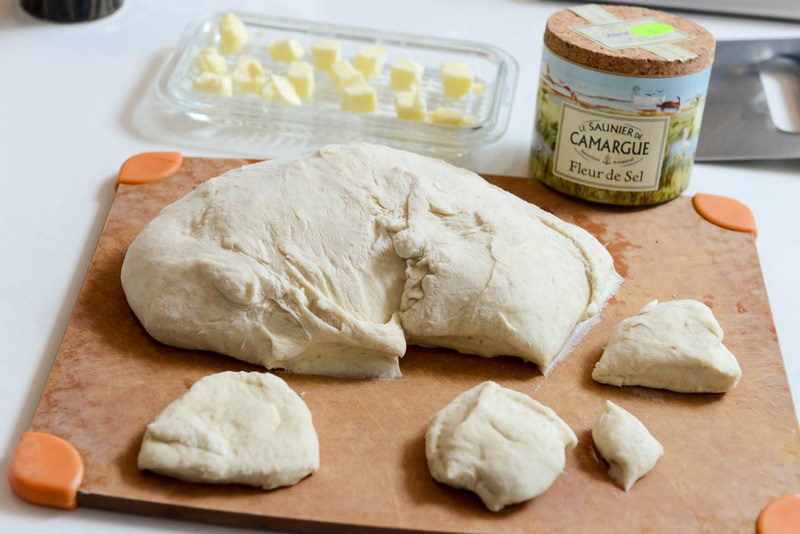 I’ve been wanting to make this bread since I bought the book, so now’s my chance. 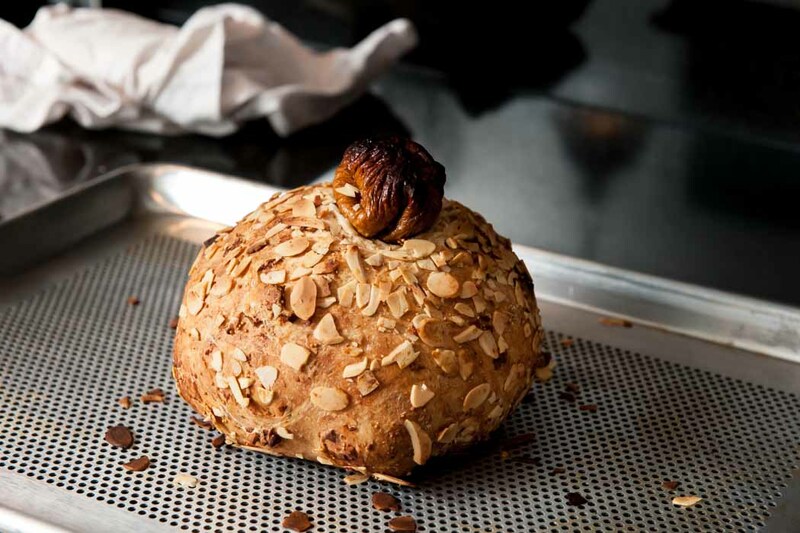 I couldn’t resist the urge to cut the bread right down the middle like the picture, and much to my surprise, the fig and almond left a very soft visual imprint. Granted, I didn’t use black mission figs, but I thought that the amount of dried fig would have been very visible. Oddly enough, the seeds distributed evenly throughout the loaf, and most of the flesh of the fruit sort of melted into the bread itself. Hmm. The crumb was dense and the bread overall didn’t have much flavour. For me, it was more of a texture thing. 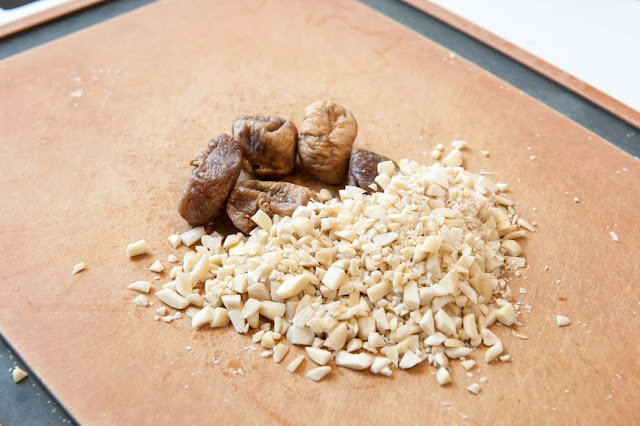 The seeds from the fig were lightly crunchy and the almonds, well they do what almonds like to do—be nutty. Still Rick and I really enjoyed eating our way through the loaf. Making this is rather routine by now. I left the starter in the fridge overnight. I’m really enjoying making bread by hand these days. 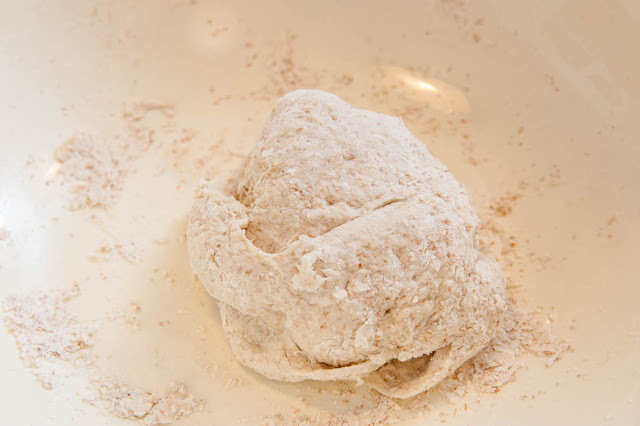 I worked hard with this dough due to the bread flour and whole wheat flour combined. 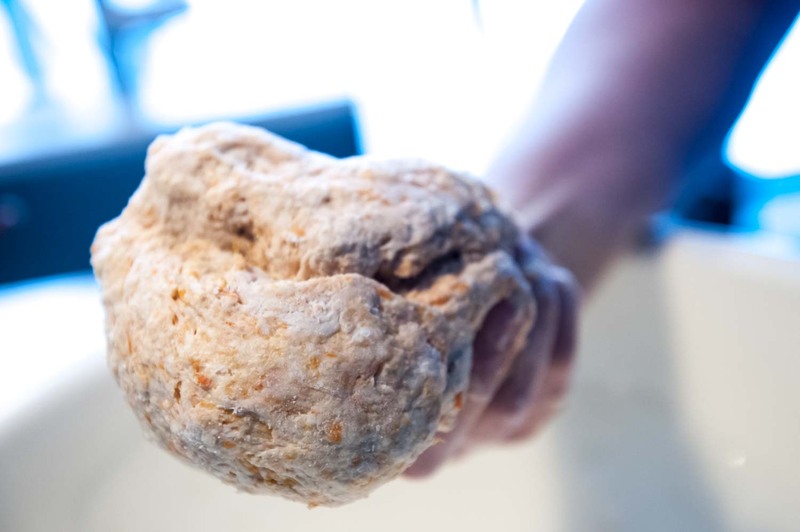 It made a very dense dough. 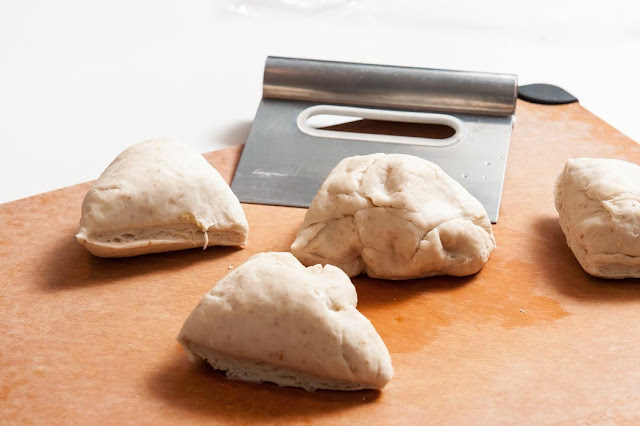 What is always interesting to me is the technique of letting the dough rest for 20 minutes changes the texture and suppleness and elasticity, then the kneading makes it sticky again. 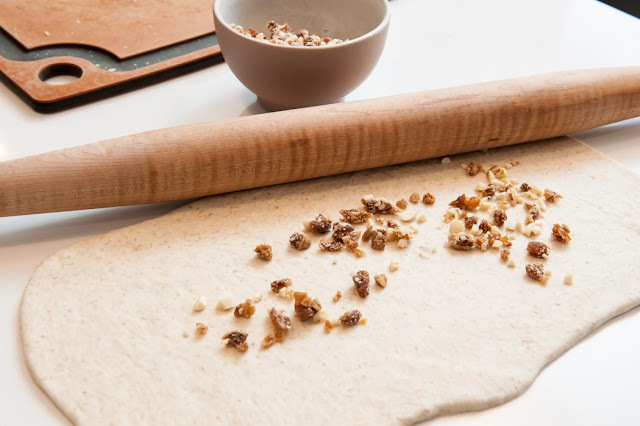 The dough was too stiff to push it into a rectangle, so I had to pull out the rolling pin. 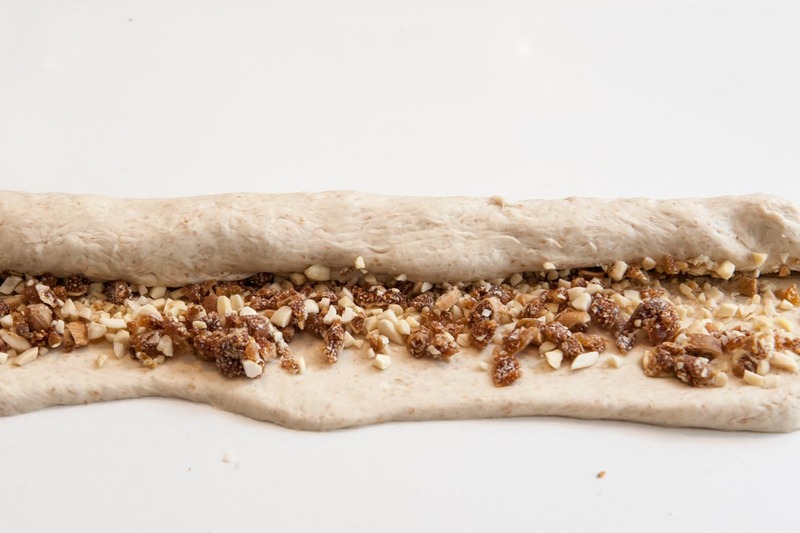 It’s wondrous that the thinly rolled dough accepts all the almonds and figs. At this stage, it seems that the title should be Almonds and Figs with a Little Bread Dough. It rose normally at this stage. I made two biz folds and let it rose again. The rise was a little less vigorous, but I was resolute not to over proof the dough this time around, as I’ve done on the last two loaves I baked. Shaping the dough made the figs and almonds push out from the surface. The dough was just oozing with them. 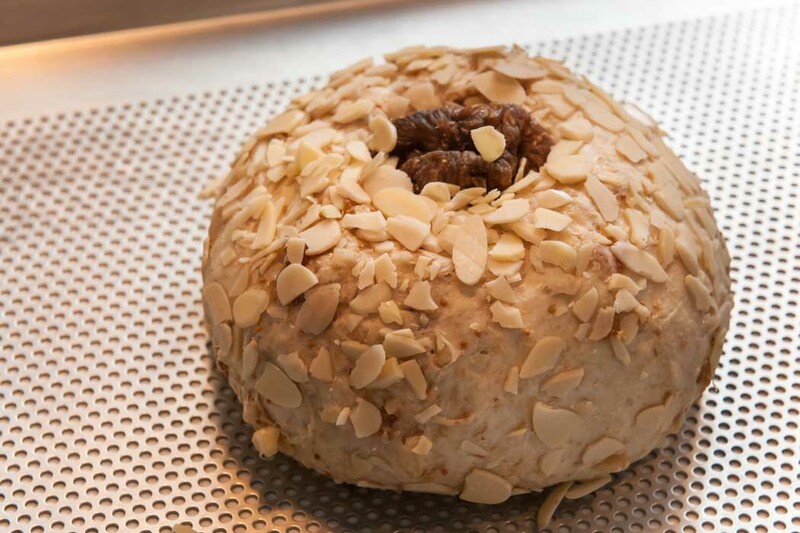 Still, I rolled the dough in the sliced almonds, but they weren’t sticking very well. I had a difficult time getting the almonds to stick in a thick layer. And for the whole fig, I had to cut a hold in the dough to insert the whole fig, and I pushed it in best as possible. I let it rise for the final time while preheating the oven. On baking, the dough pushed out the fig and it looked rather weird to me. In retrospect, I didn’t like the glaze. It was sticky and not nice to handle. I didn’t get a nice crust of almonds like the picture. Darn. The bread pushed out the fig while baking. This soft pretzel recipe seemed to conjure childhood memories for those who made them. For me, it was the streets of NYC and at the summer fairs, and for others, it was soft pretzels at school. 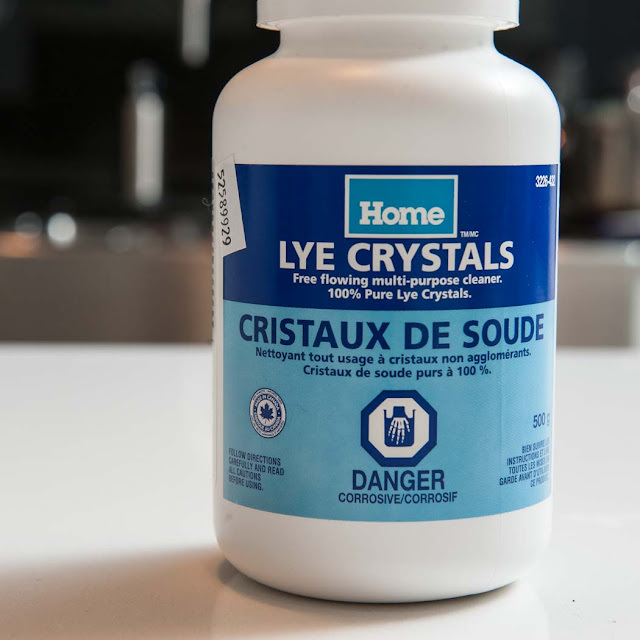 Using lye (sodium hydroxide) made the best of us apprehensive. After all, danger loomed and it seemed disconcerting to actually ingest the stuff, but I think we took a leap of faith since we’ve all eaten pretzels before that had been dipped in lye,without any known effects. 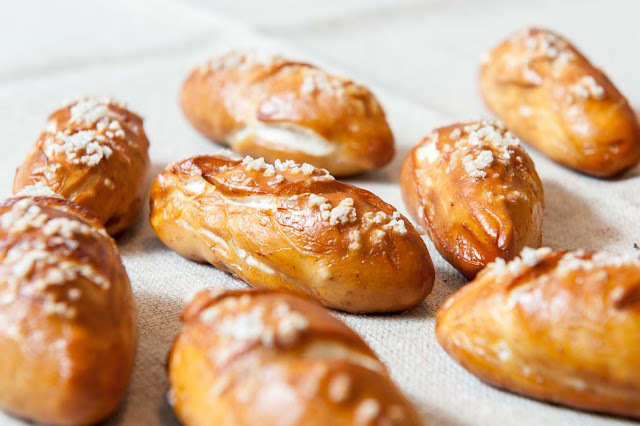 Even the best boulangeries use lye to make their expert pretzels taste authentic, so why not us! Marie B. 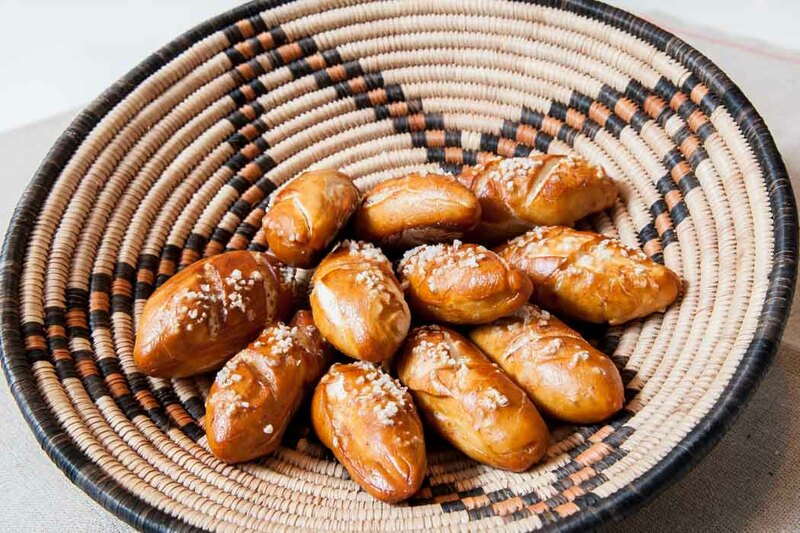 (Feeling Foodish) recalled the soft pretzel from her childhood—warm pretzels from Val, the pretzel vendor at grade school, and the hot mustard that was never seemed too hot. She made her pretzels with great expertise, and respect for the lye—the essential ingredient for authentic tasting soft pretzels. Nancy, Kristina and Elle also made the Pretzel Bread, but haven’t posted at the time this Roundup was written. 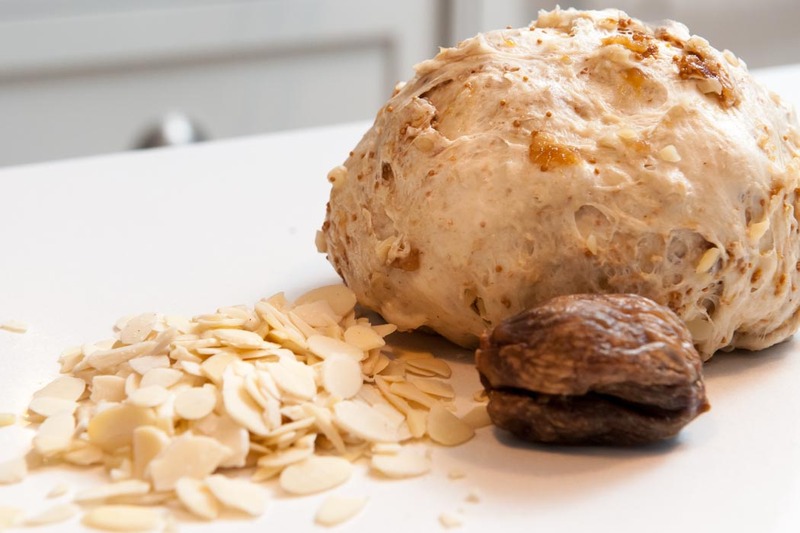 The next Bread Baker’s recipe will be New Zealand Almond and Fig Bread page 411. 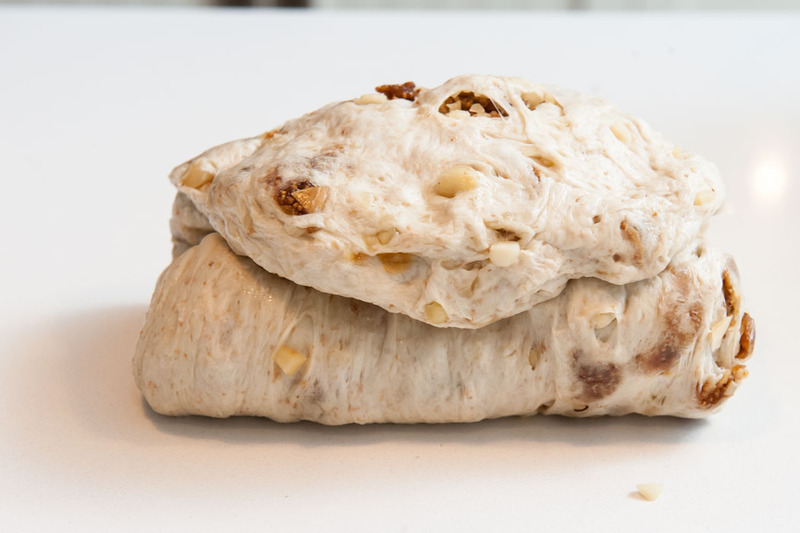 This bread was chosen as a possible Easter bread. I look forward to reading your posts. 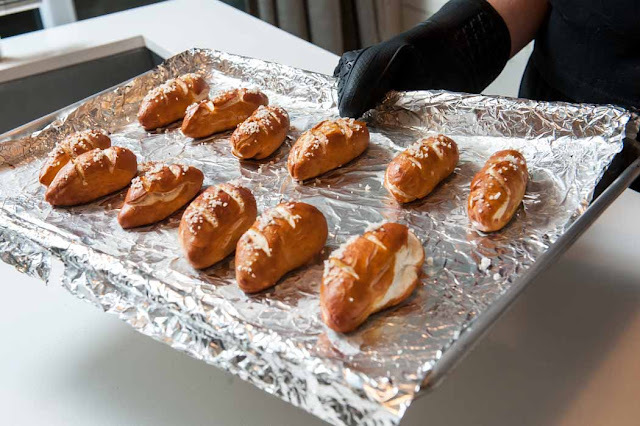 What fun I had making Pretzel Bread. I never considered it was possible to make Soft Pretzels at home, but now that I’ve made them, I see Pretzels in every book on my shelf. It’s funny, the more you experience, the more you notice in the world around you. Biting into my first homemade Pretzel Bread got me so excited. They tasted just like the pretzels I use to buy from the street trucks in NYC. It’s been so long since I had a pretzel like this, that I’d forgotten the real flavor of a soft pretzel. They were strikingly easy to make and I’m really proud of myself. 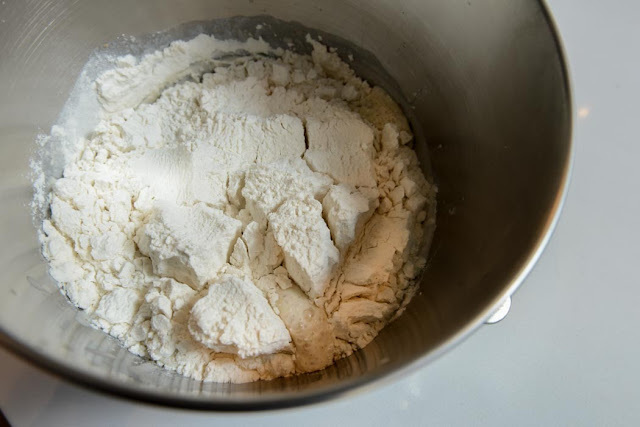 I just want to say a few words about the ingredients necessary for making Pretzel Bread. I went to a great deal of trouble hunting down the malt powder and lye (sodium hydroxide). For the malt powder, I scoured Canada and was unsuccessful in my search. I guess brands don't think enough Canadians make bread. My solution was just to throw money at the problem and be patient while the ubiquitous-in-the-US malt powder arrived at my door. The lye was a different story. Never having considered using it as an ingredient, it took me a while to find a brand that I felt comfortable enough using. Even if I used the sodium hydroxide sold as drain cleaner (lye at its impure state), at a 4% solution, I doubt anything much would have happened to me; however, I have to want to eat the pretzels after I bake them. Rick being a chemist, found me a brand that was pure enough for my purposes. It wasn’t until after the pretzels were baked and tasted that he told me a story about a highly concentrated sodium hydroxide solution that blew a tanker off its bolts. He thought that was funny. 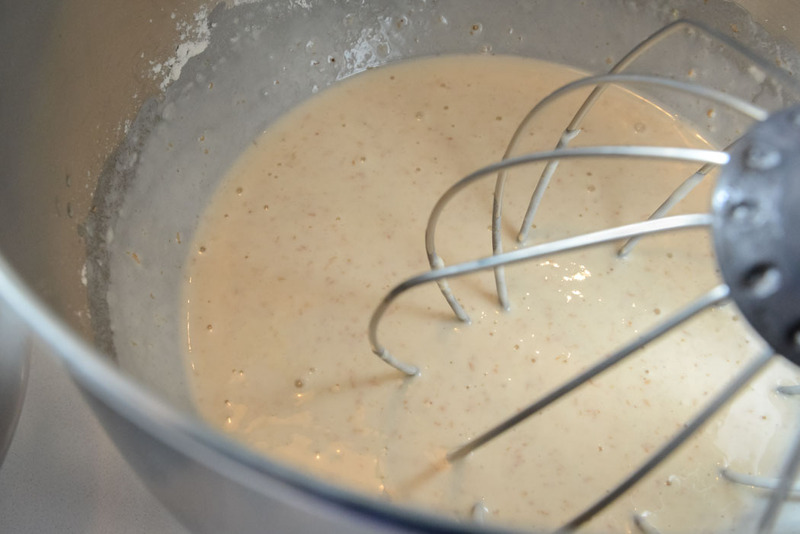 Initially the dough didn’t form a ball, so I was forced to add 1 tsp of water. After that it come together as described. I let it rest for the prescribed hour, and to my surprise, it didn’t rise hardly at all. 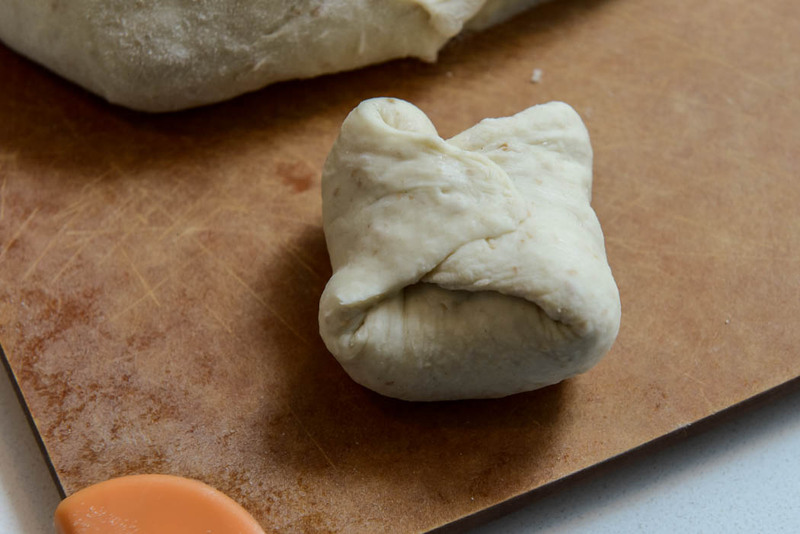 Usually, the dough will puff some and form air pockets, but not for this dough. It was a very stiff, smooth and pliable. I cut the pieces willy-nilly without weighing them, and in retrospect, I should have been more precise because the baking times for the smaller pretzels were different. Still, shaping the pretzels took some time. I wanted them to look like footballs and not pretzel nuggets. 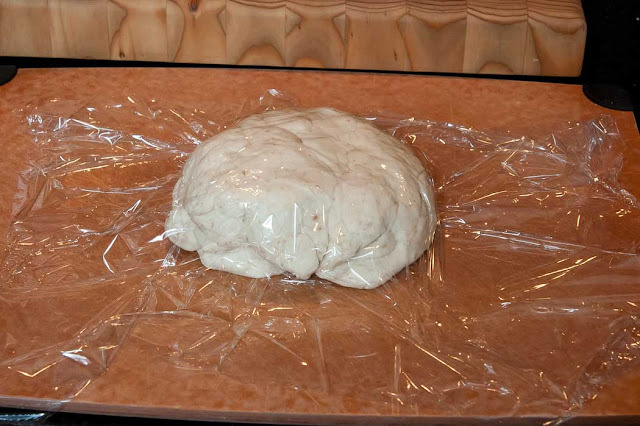 And I was impressed with how quickly the dough dried out even in the earliest stages of handling. It kept forming a dry crust after just a few minutes. I wondered why refrigerating them uncovered for one hour was important and I worried that leaving them in the fridge for three hours (that's what I did) would be the end of them. I felt so concerned about the lye, that I took every precaution. Rick has a gas mask with vapour cartridges downstairs, and I considered wearing it, but then I thought better. I wouldn’t allow making pretzels to become a drama. The lye dissolved nicely and it didn’t splash around. I survived. The moment of truth. I suited up with those thick and cumbersome red rubber gloves and got to it. I dipped the first pretzel in the solution and it became soft and very slippery. Of course the breads got slippery. 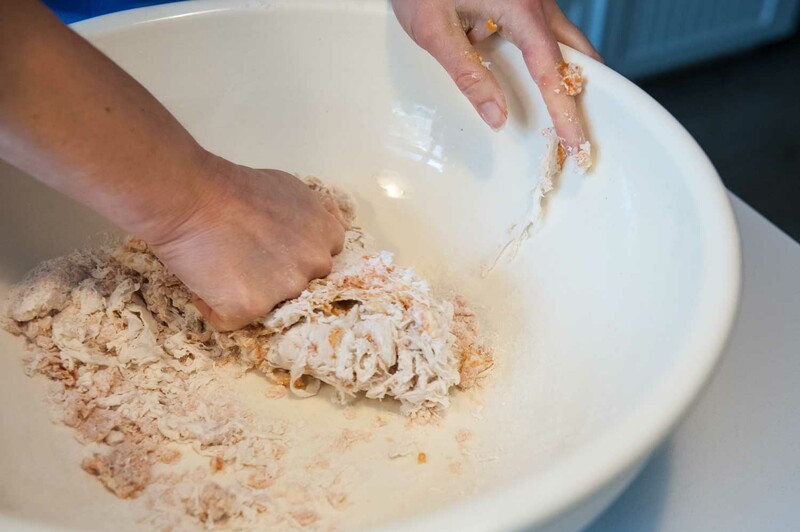 Lye is one of the primary ingredients in making soap. 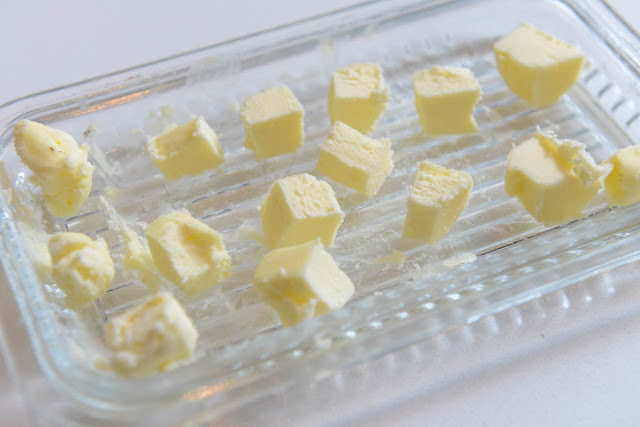 I dipped them briefly in the solution and set them on the tray. 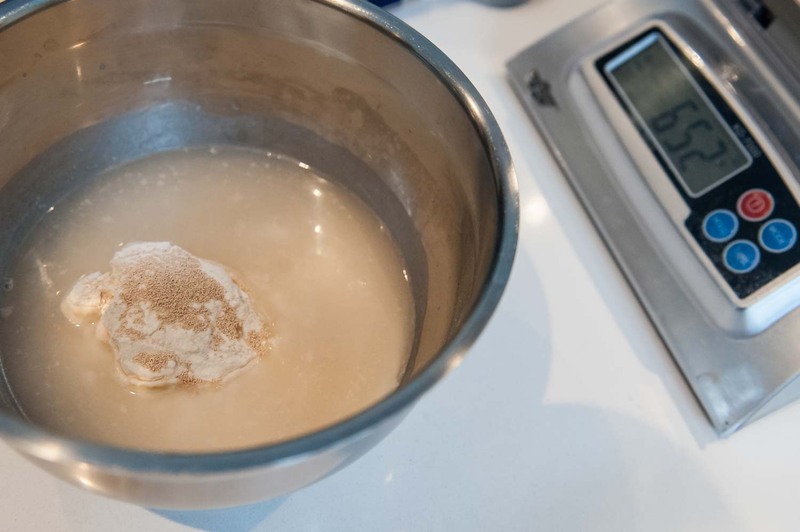 I’ve since read Thomas Keller's pretzel recipe in which he says to leave the pretzel in the solution for at least 40 seconds. I wonder how more lye glaze would change the final pretzel? 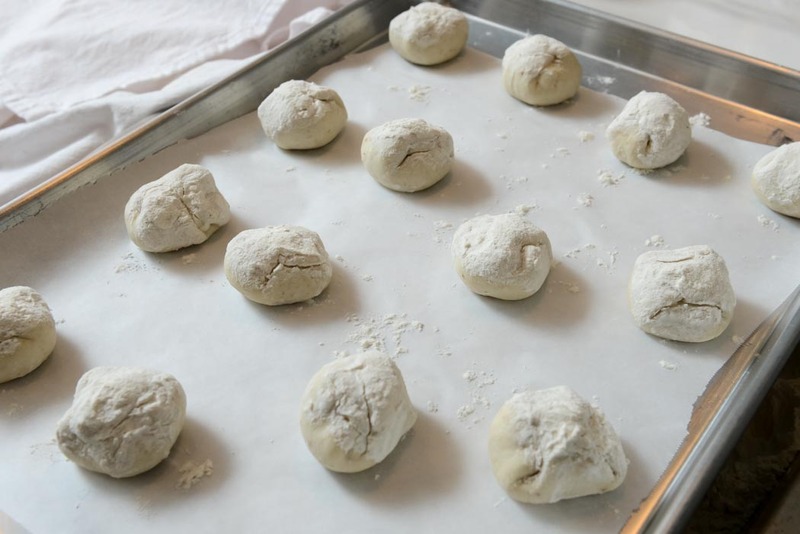 They baked easily and quickly, and they puffed substantially while in the oven. What a transformation. 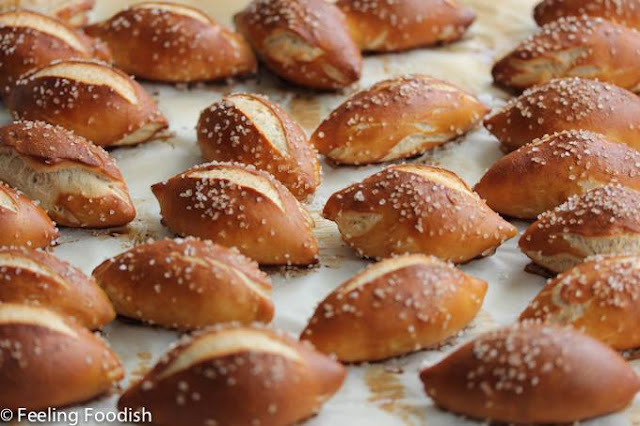 They looked like real pretzels and smelled like real pretzels, but did they taste like a real pretzel? YES! I also noted that there were areas that I didn’t glaze well with the solution and those areas didn’t brown at all. They stayed white as a lily, as were the inside of the slashes. Fascinating. In conclusion, I had great fun with this recipe. 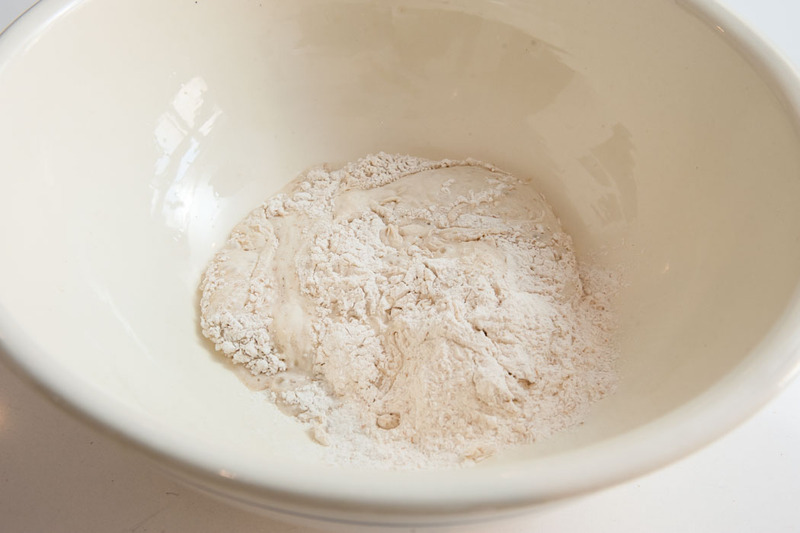 As each month goes by, I marvel at the way each bread baker approaches the bread recipe and understands the technical relationship between gluten, and proofing and flavour development. Everyone who made this bread felt it was a worthy recipe and enjoyed the addition of sweet potato to this otherwise white sandwich loaf. 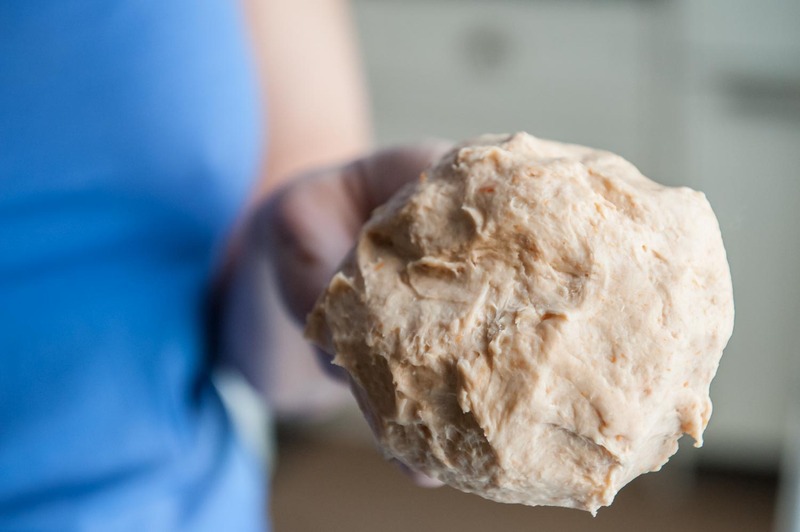 Nancy dove into the Sweet Potato Bread recipe and applied her expertise to create a loaf of bread that looks great. 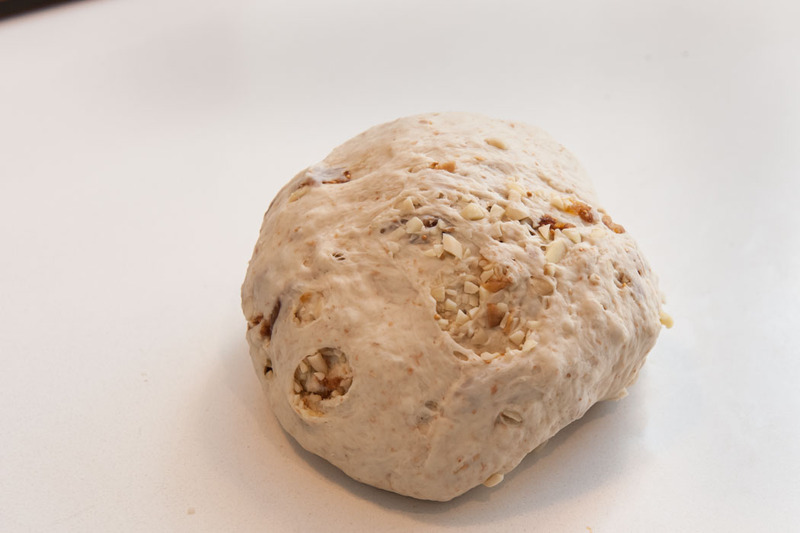 The dough performed beautifully; or as per Nancy’s opinion, it over performed. Based on the large air pockets in the crumb, it had her thinking that maybe her techniques needed adjustment, which sent her to the internet to research. An over-sized air pocket or two didn't stop her from enjoying it with a bowl of black-eyed pea stew with andouille and collards, and liked it equally as toast. Then she took the left over sweet potato and made the Sweet Potato Biscuits from the Bread Bible—Biscuits that look completely wonderful. I chose this Sweet Potato Loaf because I was curious about the way potato makes bread moist and tender. 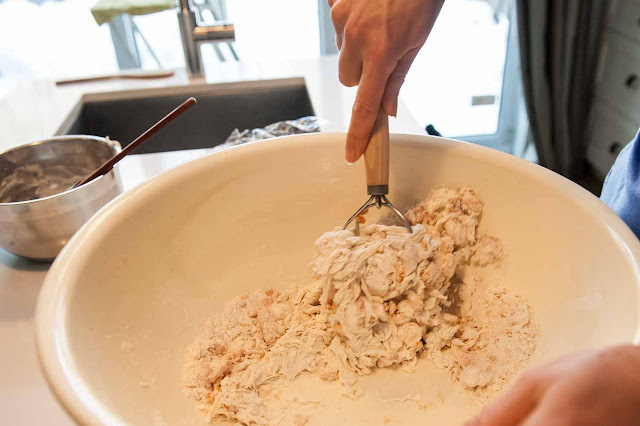 Much like the Banana Feather Loaf that derives its moisture and gentle sweetness from the banana, this loaf does the same with the sweet potato, and I am always eager to experiment with ingredients that I’ve never used before. I think Elle feels the same as I do. 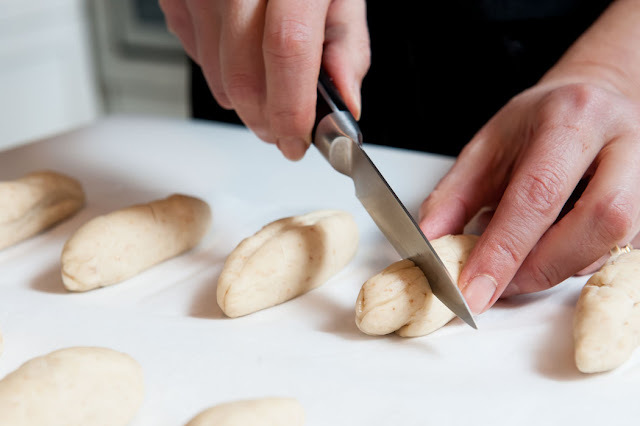 In fact, she says that “what [she] like[s] most about this bake-along is that [she] learn[s] something new every time. Whether it’s how to do a cold rise, a four-strand braid, adding exotic (for bread) ingredients, or just making a habit of weighing my ingredients.” After baking this loaf, she's added a ricer on her Amazon wish list because she thought if she had one, her bread would have been perfect. But for her (and me too) this project was a success because she got a great loaf—a loaf that included a new ingredient for bread, the sweet potato. Marie W made this bread 10 years ago and got the same results today as she did back then. Then she considered that this recipe would make great hamburger buns, and she still agrees with herself today! 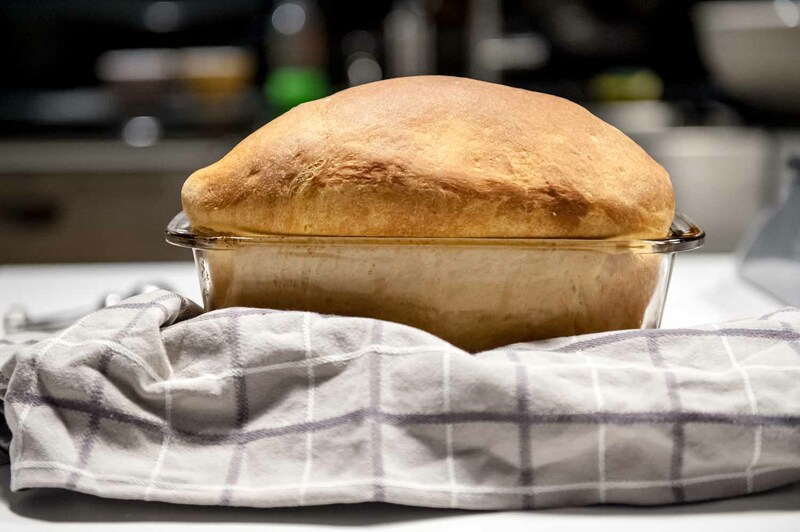 Once the loaf had cooled, she sliced herself a piece and thought it “tasted like an old-fashioned, State Fair medal-winning white bread, except that it had a more complex flavor (and it wasn't white).” Now that’s a testament to this Sweet Potato Loaf. Catherine really liked the taste of the Sweet Potato Loaf but was unhappy with the texture, as it was crumbly, meaning it fell apart quite easily even though it cut well. 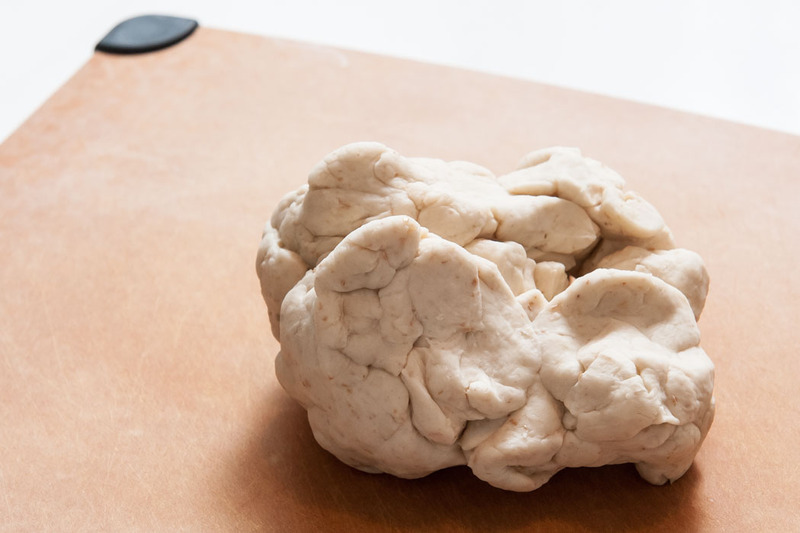 She sussed out the reasons for this kind of texture and felt that she had either over-proofed it or she hadn’t kneaded it enough, so that the gluten hadn’t developed properly. 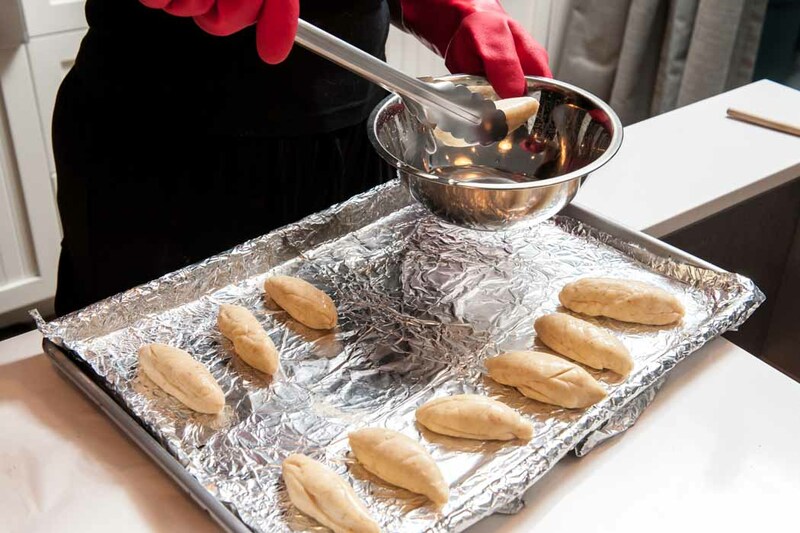 Going forward, she’ll pay better attention and do the “windowpane test” to ensure the gluten is sufficiently developed. No matter, she felt it made tasty toast. 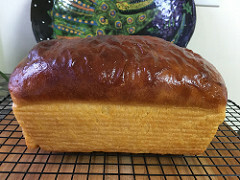 Kristina recognized that the Sweet Potato Loaf is practically the same recipe as Rose’s White Sandwich Bread, and felt very comfortable with the process. She is so efficient at making this loaf of bread that at the same time, she also made Butter Tarts—a time-honoured Canadian standard. Both turned out beautifully. She didn’t feel the sweet potato had any discernible flavour, but rather tinted the bread a slight “surreal” orange. The loaf turned into a perfect foil for melted cheese and a bowl of soup. Vicki thought the bread was amazing, and couldn’t wait to cut into it. She spread Lyle’s Golden Syrup on it. Next month we will be baking the Pretzel Bread on page 171. 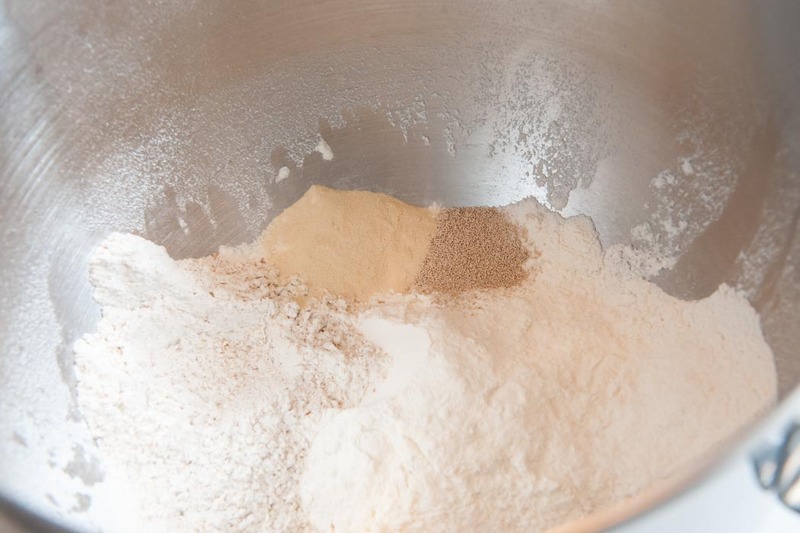 Keep in mind that this recipe calls for malt powder (non-diastatic, I believe). It's available through King Arthur. Also, for an authentic pretzel crust, this recipe calls for lye, which should be available at hardware or plumbing supply stores. Also note that there are corrections for this recipe. One afternoon I was munching on a baguette that I had just bought from a huge chain boulangerie here in Montreal—a boulangerie that presents itself as being authentically French. I noticed an oily residue on my fingers and in my mouth, and it was odd because French bread should not be like this. So I spoke to the Head Baker and I asked him if he added oil to the baguette. He said: “of course, Madame (with an emphasis on the “dame”). 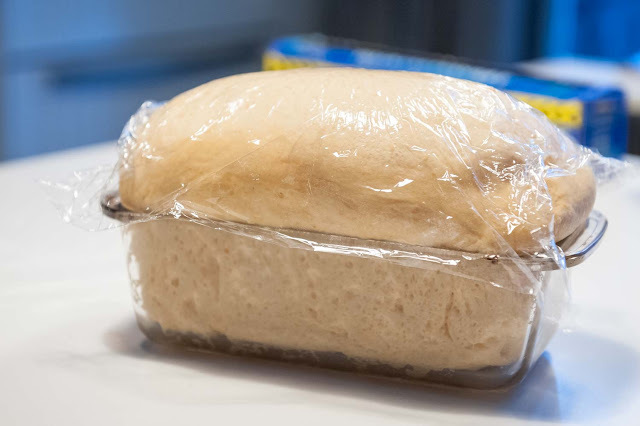 How else will the bread be moist?” I thought: This guy is a perfect example of how arrogance causes ignorance, and I never bought another loaf of bread from this bakery again. Even I know, as an amateur baker, that oil is not the only ingredient that produces moisture. This encounter made me only more curious about what makes bread moist and tender. This is why the Sweet Potato Loaf intrigued me. Not only does it contain potato (a moisture rich ingredient), but it calls for sweet potato. Much like the Banana Feather Loaf that derived its moisture and gentle sweetness from the banana, this loaf does the same with the sweet potato, and I am always eager to experiment with ingredients that I’ve never used before. Overall, the Sweet Potato Loaf was delicious. Really truly. Yes, the bread was sweetened, but in a natural way, thus I didn’t feel as though I was indulging. It was as light as air (maybe it should have been named Sweet Potato Feather Loaf). 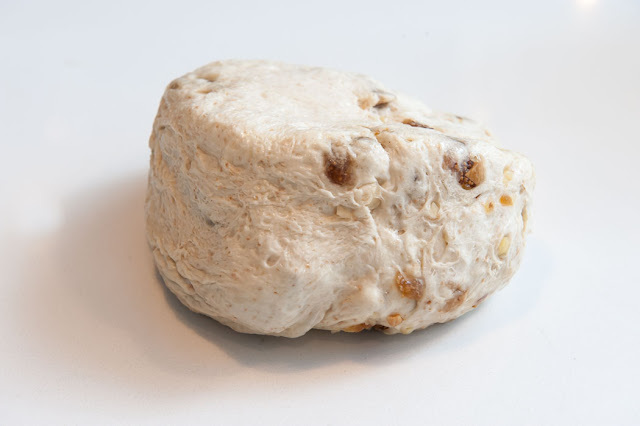 I tasted a definite sour tone—a sourness that came from leaving the dough starter in the fridge overnight, but I enjoyed it, as it balanced out some of the sweetness of the potato. In conclusion, I found the loaf a little too light in texture. It was so so tender, that I could hardly cut an straight slice without it compressing and collapsing under the motion of the knife. It’s a testament to the potato and dry milk, I think. Still, I prefer a toothier texture, but that’s not to say this Sweet Potato Loaf isn’t delightful. It is, and I’m very happy to have made it. This was a standard process for me by now. 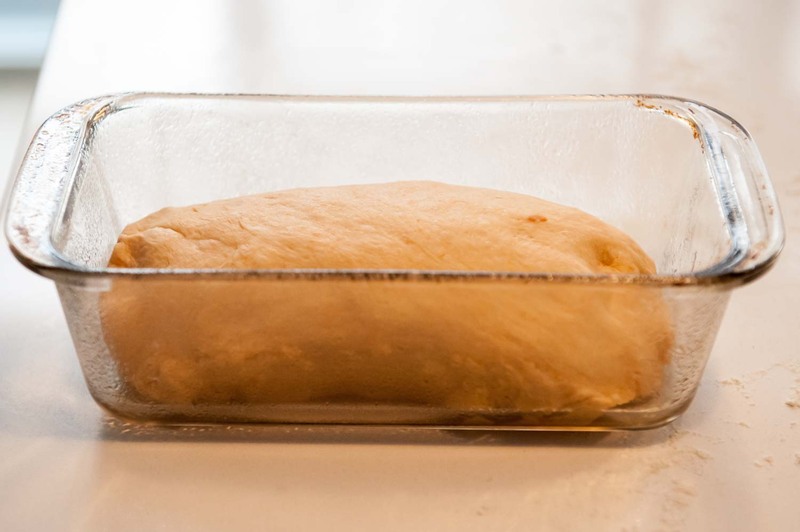 The only thing I changed was that I let the dough starter sit for an hour at room temperature and then refrigerated it overnight. I just ran out of time to see the loaf through to the end. Feeling stubborn, I chose to make this bread by hand. 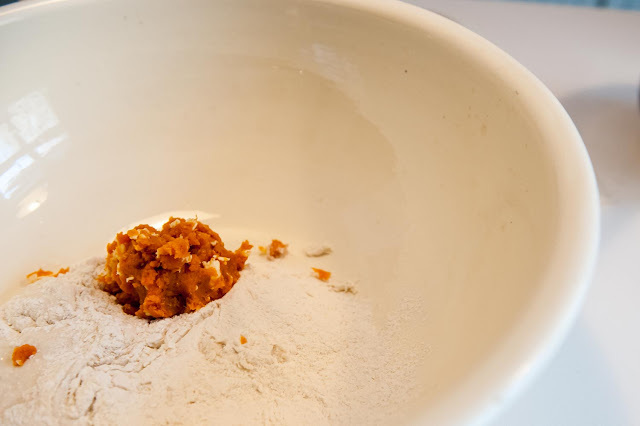 Certainly, the initial mixture was very rough and the sweet potato and butter sat chunky in the dough. 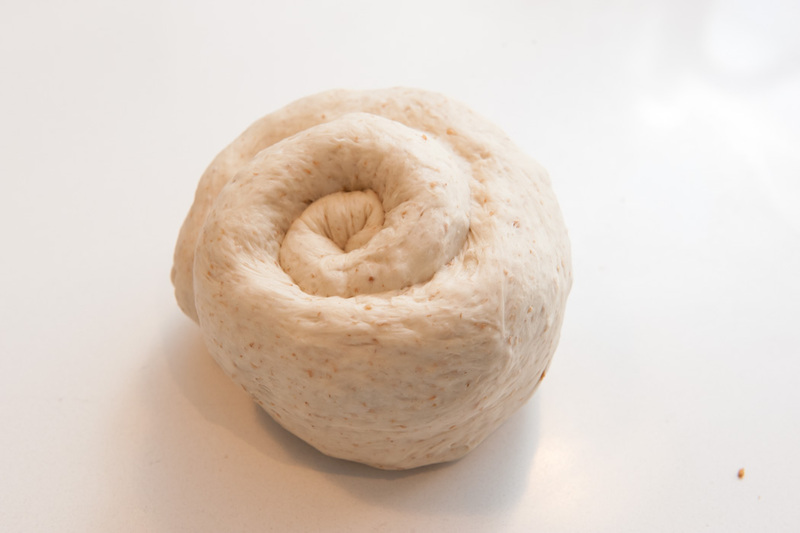 but after letting the dough rest for 20 minutes, it transformed into a beautiful bread dough. The second 5 minutes of kneading made the dough sticky again, but a little flour smoothed it out. 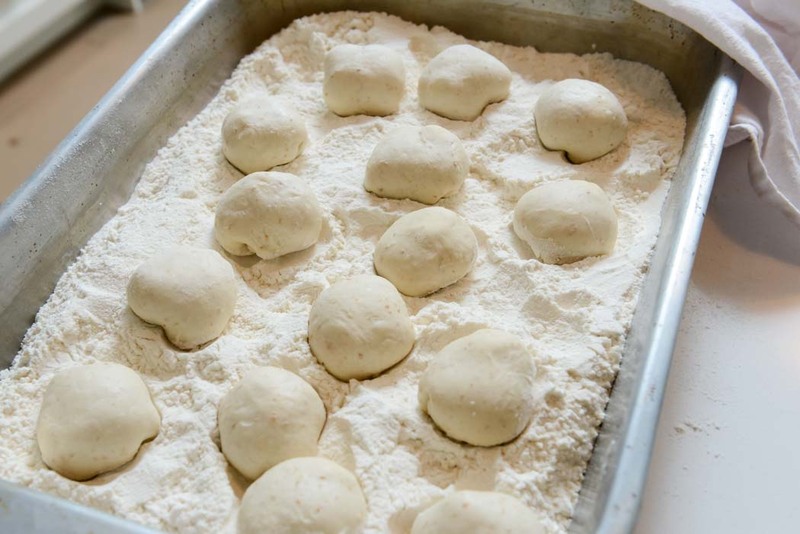 On the first rise, the dough took a good 2 hours to double. On the second rise, it took another 2 hours to double. By this time, the dough was soft and supple. I made two biz folds easily and dropped it into the loaf pan. At this point, I was anticipating a delicious loaf of bread. The bread baked very quickly. Well before the time was up, the internal temp was just over 200F. I didn’t have any trouble with the top over browning.